In the menu “Invoices” the button “Customers” allow you to add, modify or delete customers. Customer name: The name of the customer appear on invoices. Customer number: Each customer need its own number. Address: Invoice address made of the street address, the ZIP code and the city. These datas appear on invoices. Some data such as phone, email or comments are free and do not appear on invoices. They are for your own internal use. You can add, modify or delete products. Product name: how you identify the product. Product name appear on invoices. Product number: Automatic number. You can change it. Product unit: In which unit do you count the product? a bottle of water, a box of apples or a piece…. Product unit appear on invoices. Price per unit incl. VAT: It is the price per unit including the VAT amount. Account: Accounting account used to book revenues. This data will be used in a future version of the invoice. VAT code: it indicates which VAT rate should be used. This appear on invoices. Description: You are free to type any comment related to the product. This field appears on invoices. You can add, modify or delete bank accounts. Institute: Chose how you want to name the bank account. Description bank details: This appears on invoices. It is possible to use multiple lines. You can add, modify of delete payment conditions. 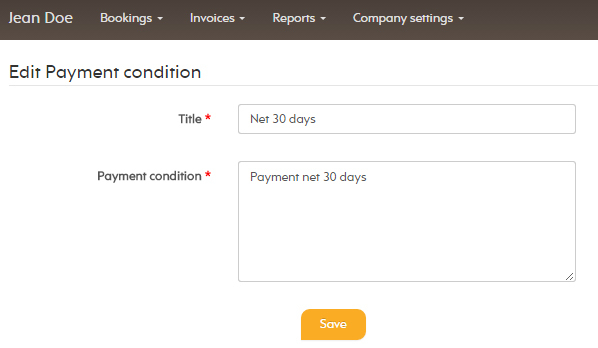 Title: Name to chose this condition when creating invoices. Payment condition: Text which appears on the invoice. It is possible to use multiple lines. Data related to your company are in the menu “company settings” -> “Company details”. Logo: The logo of your company appear on some of the designs. Company name, address and the VAT number (if you are VAT registered) appear on invoices. Now that everything is ready it is time to create an invoice.